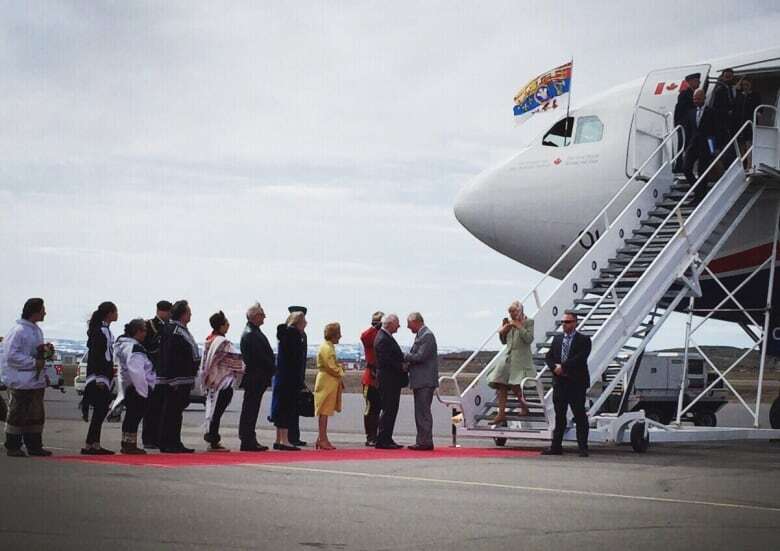 Prince Charles and Camilla, Duchess of Cornwall, began a three-day Canadian tour today in Iqaluit that included a meeting dedicated to Inuit language revitalization. Prince Charles and Camilla, Duchess of Cornwall, began a three-day Canadian tour Thursday in Iqaluit by taking in a throat-singing performance and offering greetings in Inuktitut. "Good day, I am happy to be here to have arrived to Iqaluit," Prince Charles attempted to say in the Inuit language. That went down nicely with local Lesley Giles. "He spoke in Inuktitut and he recognized that it goes beyond 150 years... that there's 400 years of interaction with British people and the Inuit people that are up here." Prince Charles first visited Iqaluit in 1970, when it was still Frobisher Bay, N.W.T. "Arriving here today brings back the happiest of memories chiefly because this is where I began my first visit to this great country almost 50 years ago," he said. "I have never forgotten the warmth of the welcome from the Inuit people, which made me feel instantly at home as indeed I have with all Canadians on my subsequent visits." Gov. Gen. David Johnson thanked the royal couple for their contributions to Canada. He also mistakenly welcomed them to "Nunavik," referring to the northern region of Quebec instead of Nunavut. The prince inspected a group of Canadian Rangers in front of the Nunavut Legislature before giving his speech. After talking to students and representatives at the Nunavut Research Institute, the royals headed to Sylvia Grinnell Territorial Park for a community feast — hosted by Nunavut Premier Peter Taptuna — where they tasted traditional country food. Jeannie Arreak-Kullualik, an Inuit language advocate, said earlier this week the most important part of the prince's visit to Nunavut would not be the public gatherings, but instead a discussion on revitalizing the Inuit language. In between the public events, the Prince of Wales ducked inside the legislature to attend a discussion with Inuit Tapiriit Kanatami's language task group about developing a unified writing system for Inuit languages. He received an Inuktitut lesson, as well as a copy of the Inuktitut-language, culturally-adapted version of the prince's children's book, The Old Man of Lochnagar. In the discussion, he heard from students of the Pirurvik Centre, who'd gained confidence in themselves by becoming more comfortable with their language. "He knows what's going on in Nunavut and in the Inuit communities across Canada; he also knows the issues here," Arreak-Kullualik said in Inuktitut. She met the prince last year, when a delegation of Inuit were invited to Wales by Prince Charles to discuss promoting Inuit languages. "He spent time listening to us when we spoke," she said. CBC North live blogged the royal visit. The royal couple heads to Trenton and Prince Edward County, Ont. on Friday.